When millions of fresh eyes recently trained on our city, Great American Ball Park (GABP) bore no scars from its labored birth which required a divisive election, moving an interstate highway, and seven years from the evening it was sketched-out on a restaurant placemat until the first pitch was thrown. Nested comfortably in Cincinnati’s new riverfront, GABP’s unlikely location in the former eastbound lanes of Fort Washington Way (I-71) entailed narrowing the highway by half and extending downtown’s street grid to the Ohio River shore. Consolidating the garage and roadway budgets for the Reds and the Bengals in one place gave us a flood-proof waterfront for the first time in our 225-year history and provided the foundation for The Banks. 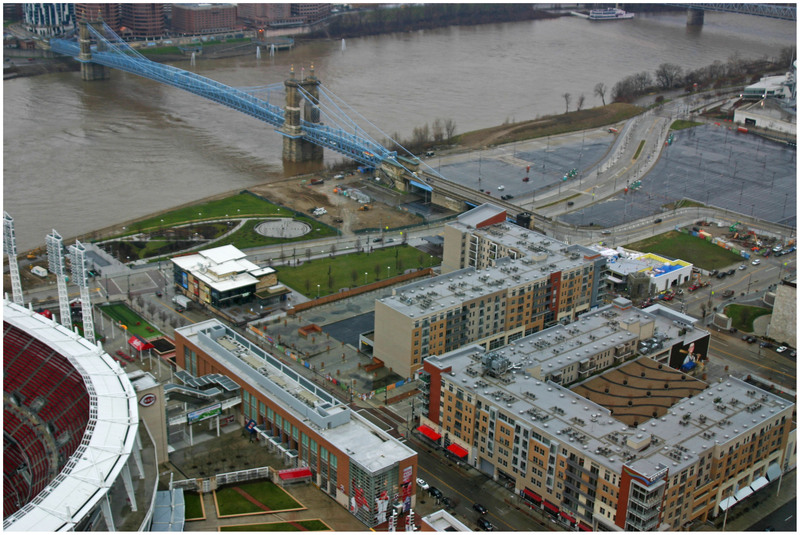 The construction of Great American Ball Park on the riverfront allowed for the rest of the land to be lifted out of the Ohio River floodplain, thus leading to the development of The Banks and Smale Riverfront Park. Photograph by Randy Simes for UrbanCincy. Proponents of an alternative ball park site at Broadway Commons park gathered signatures to place the stadium location question on the November, 1998 Hamilton County ballot. Shown how the Reds could be the keystone of a new neighborhood on the Ohio, the site at Second and Main won by a 2-1 margin. Great American Ball Park wasn’t the first time Cincinnatians resisted progress. In the mid-Nineties, we actually voted not to build the Aronoff Center for the Arts. Influential arts patrons feared its construction would cause the abandonment of Music Hall. So they put a proposal to scuttle the project on the city ballot, and it passed. But the Aronoff was a project of the state of Ohio, which built it anyway. Remember the ridiculous debate about moving the Tyler Davidson Fountain? Many influential Cincinnatians opposed 3CDC’s total renovation of Fountain Square a few years ago, which was the decisive building block for a 24/7 downtown. Getting property owners to underwrite Downtown Cincinnati Inc. also took some doing, but the central business district is now clean and safe with energized stakeholders. Not building Great American Ball Park at Broadway Commons has allowed for that site’s development into the new Horseshoe Casino Cincinnati in Pendleton. Photograph by Randy Simes for UrbanCincy. We argued about expanding our convention center, but that eventually got done too. More meetings came to Cincinnati, a spiffy new hotel opened, another will open soon, and money flowed into our economy. So tell me, had the naysayers prevailed, which of these civic assets would we happily do without? Such is The Cincinnati Process. We reflexively enforce the status quo, yet we often succeed spectacularly in spite of ourselves. Detractors can easily challenge any public proposal if they set their minds to it. They can exploit uncertainty. They can delay and drive up the costs. And they have the referendum as a ready tool. Successful sponsors learn to right-size their projects for local appetites, adapt in response to new information, and gain supporters as complex issues are resolved. The ironic result is that the most criticized ideas—the ridiculed ones, the ones they said would never happen—those are often the ones able to run the gantlet and exceed expectations. The circumstances that shaped our 21st century waterfront were so rare and of such scale they won’t be repeated in any of our lifetimes. Fortunately, agile planning and execution has given us momentum and confidence for seizing other opportunities for improving our city. Going forward, Cincinnati can have progress or The Process but probably not both. This guest editorial was authored by John Schneider, who led citizens’ efforts to build Great American Ball Park and the Cincinnati Streetcar, and was originally published in the November 15, 2012 print edition of the Cincinnati Enquirer. The editorial, however, was never published on the Internet until now with permission from the Cincinnati Enquirer. If you would like to have your thoughts published on UrbanCincy you can do so by submitting your guest editorial to urbancincy@gmail.com.